Ready to Vary Your Protein Routine? 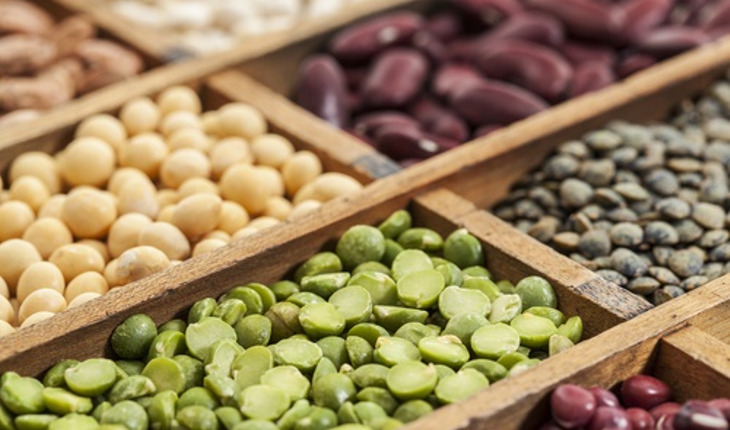 Protein foods include both animal (meat, poultry, seafood, and eggs) and plant (beans, peas, soy products, nuts, and seeds) sources. We all need protein—but most Americans eat enough, and some eat more than they need. How much is enough? Most people, ages 9 and older, should eat 5 to 7 ounces* of protein foods each day. Here, from the experts at ChooseMyPlate, a division of the U.S. Department of Agriculture, are a number of ways to get the protein you need. Eat seafood in place of meat or poultry twice a week. Select a variety of seafood — include some that are higher in oils and low in mercury, such as salmon, trout, and herring. Choose lean or low-fat cuts of meat like round or sirloin and ground beef that is at least 90% lean. Trim or drain fat from meat and remove poultry skin. One egg a day, on average, doesn’t increase risk for heart disease, so make eggs part of your weekly choices. Only the egg yolk contains saturated fat, so have as many egg whites as you want. Try grilling, broiling, roasting, or baking — they don’t add extra fat. Some lean meats need slow, moist cooking to be tender — try a slow cooker for them. Avoid breading meat or poultry, which adds calories. Choose turkey, roast beef, canned tuna or salmon, or peanut butter for sandwiches. Many deli meats, such as regular bologna or salami, are high in fat and sodium—make them occasional treats only. Get the flavor you crave but in a smaller portion. Make or order a smaller turkey burger or a “petite” size steak. Check the Nutrition Facts label to limit sodium. Salt is added to many canned foods — including soups, vegetables, beans, and meats. Many processed meats — such as ham, sausage, and hot dogs—are high in sodium. Some fresh chicken, turkey, and pork are brined in a salt solution for flavor and tenderness. For more information on nutrition issues, visit www.choosemyplate.gov.